Alrighty … right on the heels of my wrap dress I wanted to take a hard look at my closet and address a few holes in my wardrobe. Specifically for fall/winter. I was leaning toward sewing up a few wardrobe staples. Shirts …. skirts …. maybe a few knit tops. Those easy things I can throw on without thinking. This is an easy task for most people … but not so easy for me. I’m a bit more complex. I had to wrap the “wardrobe staple” thought with the “I need 2015 sewing goals” thought. And by the way … I really need to lock down those 2015 goals because it’s December 14th and I’m running out of time. Now I’ve created a hot mess of sewing goal/wardrobe staple/challenge myself thoughts in my brain and have managed to paralyze myself. Just a little jacked up right? 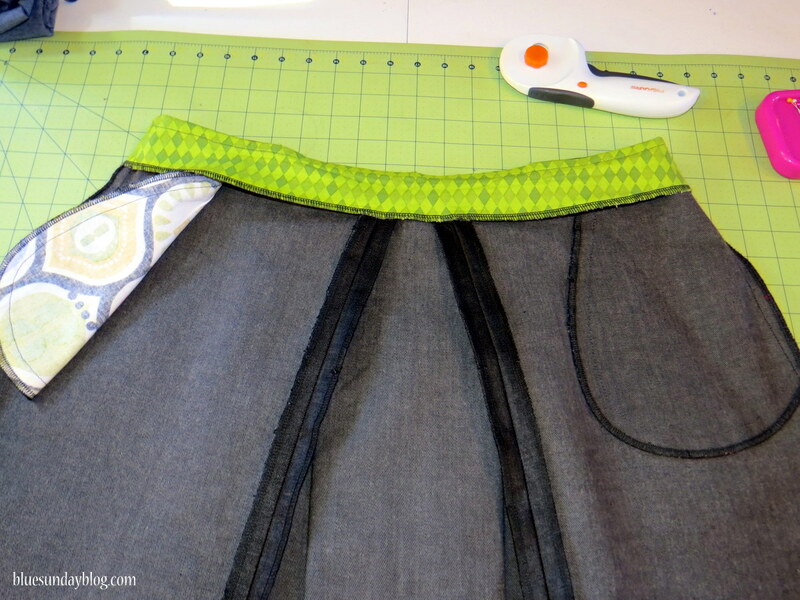 While my brain works through finding a resolution to the problem it created for itself … I decided to sew a skirt. I was thumbing through my pattern stash and came across Butterick B5929. I elected to sew Version A which doesn’t have a traditional waistband. Trying to make the best use of my time and effort, I decided to use a denim from my stash as a test garment. Sometimes I get sick of looking at muslin fabric. Every since I made the 4 test garments for my jumpsuit … I think of the Stay Puft Marshmallow Man every time I look at muslin fabric. With using the denim, worst case scenario … I would be out of fabric from my stash. Best case … I have a wearable test garment. I picked up the fabric at Hancock Fabrics a few years ago and I think it’s considered a heavy-weight denim. In retrospect, it’s probably too stiff of a denim for this pattern for two reasons. 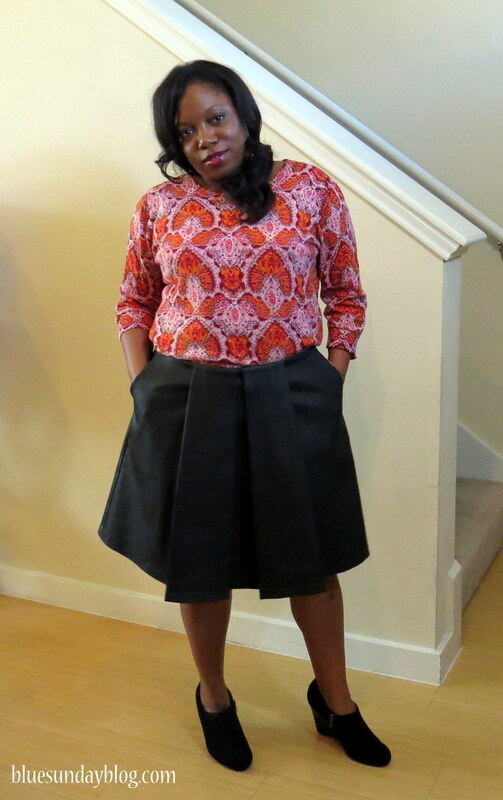 First – I had to wrestle with the waist on this skirt. And when I say wrestle, I really had to wrestle. I spent a ton of time at the iron getting that waistband to lie flat with the facings. I attempted to counter the heaviness of the denim this by using a heavy-weight interfacing on my cotton facings, but it didn’t help much. Maybe that wasn’t the best way to handle it. If you have thoughts on this let me know. In the end I won … me and that Rowenta make a great team … though that denim fought me every step of the way. Second – This is a stand up skirt. Meaning, the fabric isn’t conducive to sitting, standing up, and sitting again. The fabric is stiff, it doesn’t flow, and the pleats don’t easily fall back into place. 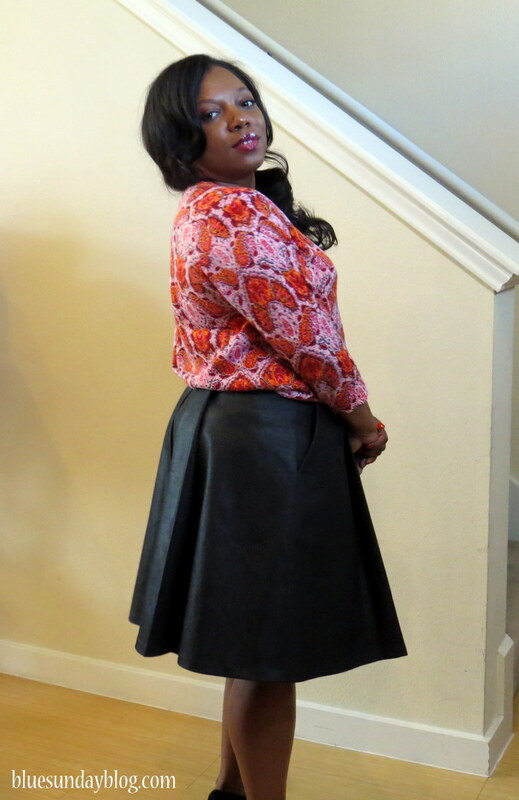 Those issues being said … I do like how this skirt looks, and will probably wear it again. But I’ll save it for events where I’ll be on my feet most of the time. B5929 is a semi-fitted skirt through the hips, with side pockets and a back zipper. In my Lesson’s Learned post I mentioned how I’ve been selecting the wrong size on my patterns. With that, I was very careful about selecting the pattern size. I sewed an 18 waist grading out at the hips to a 20. If I sew this pattern again I can probably take in the waist a bit more. This sits on my hips more than at my natural waist. I probably need to shorten the skirt, but for this time of year, I thought it would be okay to wear with my shoe boots or my taller boots when it’s super cold. For the zipper, I wanted pizzazz. With that, I added an exposed zipper. Having never installed one before, I quickly searched online for tutorials. There’s a lot out there (of course). But the one I followed, (and liked the most) was a photo tutorial on Craftsy. I found the photos and steps were easy to follow, and provided me the results I was looking for. 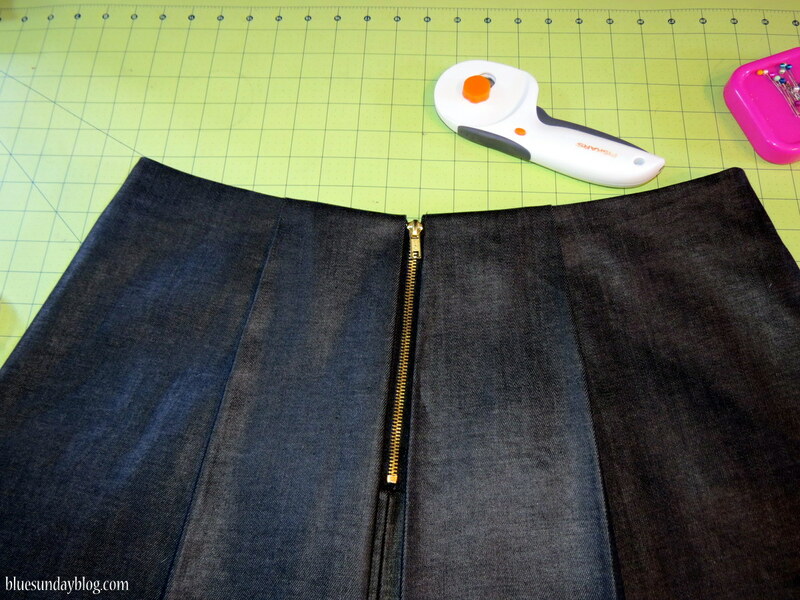 In the end, I like how the zipper peaks out from the back pleats … it’s a bit of a surprise. The pattern is overall pretty easy to sew and definitely worth the effort. The pattern instructions are straight forward, and a good option for a beginner sewer. This is my second Butterick pattern – my first was B5555, and I’m starting to really like Butterick patterns. Initially I was a little frustrated with the big 4 patterns, but as I learn more about sewing in general … the pattern instructions are easier to understand. While I think this pattern is a wardrobe staple, I don’t know if this particular skirt is something I’ll wear a lot. I am pleased with the execution and will make it again (out of a different fabric – smile). Back to sewing goals … do you have them? Have you thought about your goals for the new year? Please share them with me in the comments section. 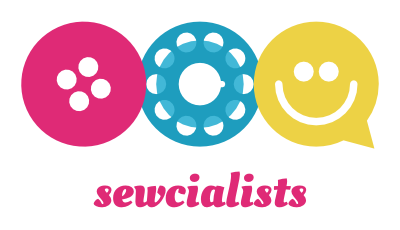 Hopefully hearing about your goals can help me define my sewing goals. Thanks again for stopping by, and sharing my sewing journey with me. I like this and you should definitely make it again in a more forgiving fabric! Thanks so much Carolyn. I will definitely give it another try! 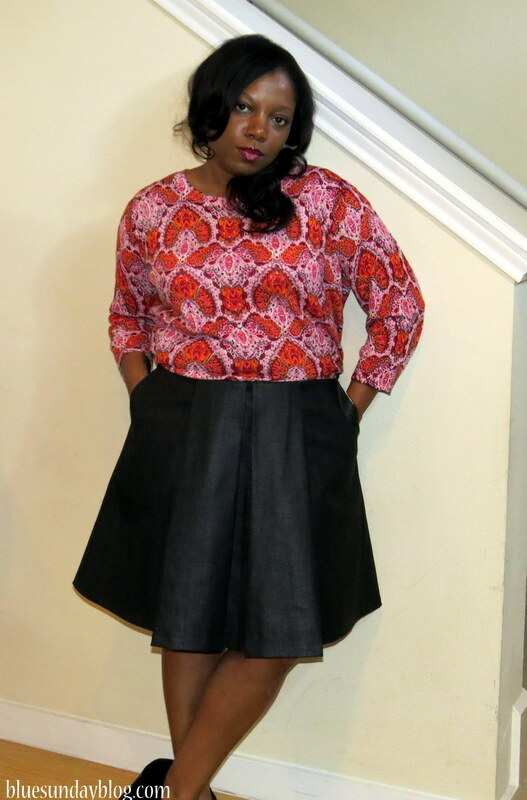 You already know what my 2014 goal was – sew a 5-7 piece ensemble each quarter with wearing purpose in mind. Each ensemble had to be made from at least 50% stash fabric and patterns. I really enjoyed this goal and what it has done for my wardrobe and my stash. I considered changing my 2015 goal to working through all of my Craftsy classes and making whatever comes with that class, but I have ultimately decided to repeat my 2014 goal but with an added focus of trying to improve my understanding of good proportion and design lines in the ensembles. Good luck with selecting your 2015 goals! Whatever you decide I know you will go after it with great vigor! Hi Sheryl! Thanks! I was reading about design lines and proportion in the Vogue Sewing Book a few weeks ago. That’s a great goal! I enjoyed everything you sewed for 2014 … it all looked great! I can’t wait to see what you’ll make in 2015! I don’t think I would ever use heavy interfacing with denim – just adds more bulk. Understitching a facing will work wonders for controlling it and that might have been a good solution in this case. Hey Brooke, you’re right. Now that I think about it, All I did was add more bulk with the heavier interfacing. I also didn’t think about under stitching the waist band. I’m going to go back and note that on the pattern as something I should do regardless of the fabric I use in the future. Great guidance … thanks!! Nice job on the skirt! That pattern would be so pretty done up in a lightweight, drapey fabric for summer. And you’ve got yourself a wearable muslin until then. I know exactly what you mean about getting tired of muslin. I’m going to do a muslin soon for the vest I’m making my partner and I’ll use a cheap flannel with hippos on it! MUCH more fun and actually a better approximation of the “real” fabric, which will be boiled wool. As for sewing goals, I don’t think they work very well for me. Sewing is my fun, creative, stress-relieving time, and I’m finding I like a little more spontaneity in it. If I see a wardrobe gap, I prioritize the project that will fix it, but otherwise I like to just go with what appeals to me at the moment. Can’t wait to finish my holiday projects so I can get back to it! Okay I love using fun fabric for the muslin!! Just the thought of the fabric with the hippos makes me smile. Love it! Your thought is making me think, I’m really over thinking the goals. Maybe it should be something generic like – pants and blazers. I’m putting pressure on myself when I don’t need to! What you might do is set a different type of goal for yourself, like a goal of sewing (or doing something sewing-related) for half an hour a day, or three times a week, or whatever. I find process-related goals like that work better for me than outcome-related ones. It just feels like less pressure to PRODUCE, you know? But you still keep moving toward what you’re trying to get done.